an interesting interview full of Herzogian wisdom. "It's always liberating to show some self-irony. It always does good for a grown-up man to make fun of himself." ‘Ghost Town’ and Guerilla Filmmaking From China - NYTimes.com: "An underground filmmaking subculture emerged in China in the late 1980s, but it began to flourish only about a decade ago with the advent of inexpensive digital cameras and postproduction computer programs that helped put filmmaking further out of reach of the government authorities. Many of this latest generation of Chinese filmmakers have no formal film training and shoot on minimal budgets, often with small crews, or alone. 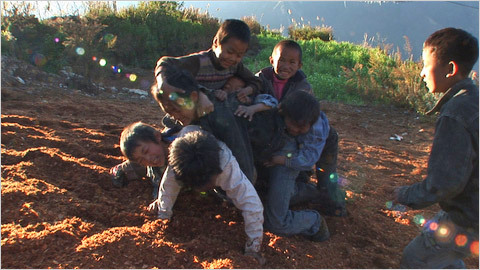 Ying Liang, whose films have won numerous prizes on the international circuit, shot his widely celebrated debut film, “Taking Father Home,” using a borrowed camera. Relatives and friends were his cast and crew. “Unlike in previous generations, the stars of this generation are not only Beijing Film Academy graduates,” said Karin Chien, a film producer in New York and president of dGenerate Films, a company she founded last year to distribute this new crop of independent Chinese films outside China. “They’re journalists, they work at television stations, they’re painters, they’re people who just picked up a camera and made a film for $1,000.”"
About 20 filmmakers have been banned from making films for two to five years, according to Zhang Xianmin, an independent film producer and a professor at the Beijing Film Academy. Others have received intimidating phone calls, had tapes confiscated or been detained and interrogated. But according to several filmmakers and film scholars both here and abroad, the government recently appears to have adopted a somewhat hands-off, though highly watchful, posture toward this film vanguard, leaving it to operate in an undefined gray area. It seems that as long as certain incendiary topics are not broached — among them the Tiananmen Square massacre, Tibet, the Cultural Revolution, the outlawed religious group Falun Gong — then independent filmmakers are allowed to work. Yet no one is absolutely sure where the boundaries are, or whether the government will start to clamp down more fiercely. Despite this pressure and uncertainty, there are now at least four major independent film festivals around the country and at least two theaters, both small, dedicated to showing Chinese independent films. Mr. Zhao began his career in the fine arts. He studied oil painting at an art academy before dropping out and working as a professional artist and advertising director in Beijing and Guangzhou. He eventually founded his own advertising firm as well as a journal for contemporary arts, and he opened a gallery in Shanghai. His first documentary was “Street Life,” a portrait of recyclers on the streets of Shanghai, which had its premiere at the Viennale in Austria in 2006. “Ghost Town,” his second film, is a series of vignettes and scenes that explore the economic struggles, religious beliefs and relationships of the residents of Zhiziluo, which had once been a local county seat for the Communist Party but was largely abandoned by the government. Mr. Peña said he had heard about the film for some time but finally viewed it in the 11th hour of the festival’s film-selection process. “It’s one of those films that, when we saw it, there was little question in our minds that it should be included,” he said. “Ghost Town” is the first documentary from China’s new generation of digital independent filmmakers to be included in the New York festival. Mr. Zhao, who continues to support himself by shooting television advertisements, said he had no illusions that his films would ever make him much money. H2N: Do you have any optimism that things [in China] may improve? ZD: I really don’t have the time to think about it, because it’s outside of my control. The only thing I can do is persist in making my films. That is something I have control over. For Chinese independent filmmakers, it’s important for us to be persistent, to insist on making good quality films, and that will hopefully change the environment in the future. H2N: You were a painter, and you worked in advertising. How did that lead to becoming a documentary filmmaker? ZD: When I was a professional painter, the overall goal was the same, to find the best method to create art. As you mentioned, I was working for an advertising agency making commercials, but I don’t see that as creating art—that is just a way to pay the bills. Going back to this idea of finding different ways to make things—during that process, I did installations, performance art, voice, painting of course; I used different media to express my creative energy. I think it was a process of exploration, of finding what would be the best medium for me. Right now, film is something with which I can capture the essence of the subject matter I want to depict. The time is right for me to use film.